Since 1977, Maryland Sea Grant has funded scientific research relevant to the Chesapeake Bay and the Maryland residents who conserve, enjoy, and make their living from it. We strive to fund projects that both advance scientific knowledge and offer practical results benefiting ecosystems, communities, and economies throughout the Chesapeake Bay region. Click on an individual project to find out more. Search current and past research projects here. The eastern oyster, Crassostrea virginica, has historically been a species of tremendous importance to the Chesapeake Bay economically and ecologically and provides numerous ecosystem services, including water filtration, habitat and food for many other Bay species. Significant hatchery and aquaculture efforts are currently underway to recapture the economic and ecological benefits of a robust oyster population within Chesapeake waters, whether for human consumption or to promote improvements in water quality and benthic habitat. The Anacostia River is among the most polluted tributaries in Chesapeake Bay. With substantial algal blooms and bacterial contamination, it has placed those who recreate on the water at considerable health risk. The first phase of a recently completed, multi-billion dollar infrastructure project, the Anacostia River Tunnel, which will retain and divert sewage and storm water effluent is due to be operational by March 2018. The tunnel project is award-winning from the perspective of the engineering community, but the environmental outcome is yet to be determined. Hatchery-based enhancement of marine fisheries is being undertaken on a worldwide scale, but the genetic impacts of these practices, specifically their effects on diversity and long-term population resilience, are often not fully understood and rarely monitored. Intensive hatchery-based restoration is underway in the Chesapeake Bay supplement depleted eastern oyster Crassostrea virginica populations, but the potential genetic impacts of this program remain poorly understood. Traditional mapping of riverbed features is performed through cross-sectional surveys at limited locations within a river segment. Such methodology leads to an incomplete picture of riverine processes, including aquatic habitat variability and sediment fluxes. Recently work has shown that cameras mounted on an unmanned aerial vehicle (UAV) can be used to continuously map fluvial features at a relatively low cost. UAVs can significantly increase efficiency of data collection, while also providing continuous data, which is not feasible with cross-sectional methods. Rock Creek is a tidal tributary to the Patapsco River in Anne Arundel County, Maryland and has historically had poor water quality including the development of water-column anoxia. An aeration system was installed into the creek in 1988 to help alleviate the water quality problems. Several recent studies have been conducted on the creek in order to view how aeration affects sediment nitrogen and oxygen fluxes, but less emphasis was placed on the associated production of problematic compounds. Researchers will examine how Eastern oysters (Crassostrea virginica) respond to acidification of Chesapeake Bay waters caused by climate change and to low-oxygen (hypoxic) conditions. Understanding these responses is important to ensure success in efforts to restore the Bay’s wild oyster population and expand oyster aquaculture. We have developed a technology to efficiently produce infertile fish by disrupting primordial germ cell development in fish embryos. The technology uses a bath immersion to administer a Morpholino oligomer (MO) against Deadend (Dnd), an essential protein for early germ cell development in fish. This approach has been successfully used in the zebrafish, trout and salmon. The goal of this proposal is to examine the feasibility of applying this technology to sablefish. Government agencies have expressed concerns about the potentially negative impacts of contaminants of emerging concern (CECs), such as pharmaceuticals and personal care products, on coastal ecosystems. Few data are currently available on the sources, levels, and spatiotemporal distribution of these contaminants in the Chesapeake Bay. Projected increases in intense precipitation events have the potential to alter the amount, source, and timing of stream nitrogen export and associated ecosystem impacts to the Chesapeake Bay. But, relatively little is known regarding amounts and sources of nitrogen exported during precipitation events and possible controls, such as hydrologic flowpaths and land use. While existing research addresses many of the important issues of oysters in Chesapeake Bay (CB), the fate and effects of resuspended oyster biodeposits in aquaculture areas on the nutrient, light, zooplankton and phytoplankton dynamics have not been taken into account when the use of oysters in mitigation of eutrophication in CB is examined. Currently, models do not include the effects of biodeposit resuspension on the ecosystem, nutrient dynamics and light and experimental data are not available. This research looks to improve the the sediment-transport model between the lower Susquehanna River to the upper Chesapeake Bay through the development of sediment budgets and exploring techniques to differentiate sediment sources. Results from this project are expected to inform water quality and coastal resilience issues in the Chesapeake Bay region for local governments and the general public. Microbial biofilms are formed for protection from grazing, the mitigation of competition between species, the facilitation of gene transfer and the overall increase of the possibilities of survival. Biofilm formation on plastic is no exception, and microplastics provide further advantages for microbes as these particles can subsist for decades in aquatic environments. Microplastics are polymer particles that are smaller than 5 mm and their existence and prevalence in aquatic environment has been the focus of many studies in the last few years. The existence of spatial structure in populations of exploited marine fishes challenges our ability to develop reliable stock assessments. Using the northern stock of Black Sea Bass (BSB - Centropristis striata) on the US Atlantic coast as a model species, I will combine empirical and analytical approaches to explore the impacts of the spatial resolution of population and assessment models on the reference points generated by assessments. Researchers will develop computer models to simulate the impacts of long-term sea level rise and episodic storm surges on the low-lying lands of Maryland's Eastern Shore in 2050 and 2100. The project will utilize web-based graphics to help communities to better understand risks of coastal flooding to people and property at street-level detail. This regional project funded by the Delaware, Maryland, New Jersey, and Virginia Sea Grant programs will provide insight into best practices for stabilizing barrier islands and conserving tidal marshes behind them in ways that preserve biodiversity and beach width as well as stores of carbon that are naturally sequestered in marshes. Areas to be studied include Parramore and Assawoman islands in Virginia; Fenwick/Assateague Island in Maryland and Delaware; and Long Beach Island in New Jersey. This research aims to aid communities in addressing the question, “are our climate adaptation investments increasing our community’s resilience?” The state of Maryland and its communities are acutely interested in this question because they are being, and will continue to be, impacted by a range of climate impacts. As a result, Maryland has been aggressively setting reduction targets to mitigate greenhouse gases emissions and developing adaptation strategies to increase its resilience to the human health, economic, and environmental impacts of climate change. Microbial communities govern the transformation of energy, carbon, and nutrients in aquatic ecosystems. In Chesapeake Bay (CB), microbes drives seasonal hypoxia and and forms the base of the foodweb that sustains important commercial and cultural fisheries including oysters, crabs, and striped bass. The efficacy of virtually any management plan that seeks to improve the health and resilience of CB intrinsically requires a fundamental understanding of these tiny but mighty organisms. Most stream restoration is predicated on the assumption that modifications to local physical habitat can positively influence stream biota and ecosystem integrity. However, conventional field surveys rely on coarse scale summary of aquatic habitat as well as fine scale measures of channel hydraulics at intermittent locations within a sampling reach. Thus, contributions of habitat modification in the restoration process remain poorly understood. Zooplankton are critical food sources for marine fish, and climate-driven changes in their abundance, diversity, and quality can have profound effects on larval recruitment and fisheries productivity in coastal oceans and estuaries. Despite the importance of prey for understanding variation in fisheries recruitment, accurate identification of zooplankton species remains challenging and a lack of information on prey quality and prey selectivity by fish may hinder the discovery of relationships between zooplankton and fish productivity. To ensure that Maryland's coastal resources are resilient and sustainable, the agriculture that is vital to the state economy must find ways to reduce nutrient runoff into precious water resources. One such way is a best management practice (BMP) that uses control structures to manage drainage water levels in farm fields. The goal is to increase the amount of denitrification by elevating the water table. Maryland Sea Grant seeks to hire a Science Writer / Editor to explain and share findings from scientists, extension agents, and other sources to help advance public understanding and management of Maryland's natural resources. More details. 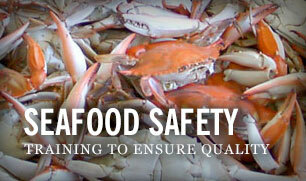 Maryland Sea Grant is currently accepting applications for four graduate fellowship programs. Check out our fellowship page for more details! Knauss legislative fellowships in Congress help build careers — and they're fun and educational. See our video and fact sheet for details. Maryland Sea Grant seeks to hire an Assistant Director for Communications and Engagement to lead our team of writers and content producers. More details. Maryland Sea Grant has program development funds for start-up efforts or strategic support for emerging areas of research. Apply here. Smithville is a community on Maryland’s Eastern Shore, on the edge of the Blackwater National Wildlife Refuge. A century ago, Smithville had more than 100 residents. Today, it has four, in two homes: an elderly couple, and one elderly woman and her son, who cares for her. Ethan Hain studies the occurrence and toxicity of contaminants of emerging concern in the Chesapeake Bay. In his spare time, Ethan enjoys cooking, baking, and playing soccer. An essential resource for researchers, students, and managers. Get your copy today! ©2018 Maryland Sea Grant. All rights reserved.